‘Tis the Season. To be merry, to be bright, to be jolly. 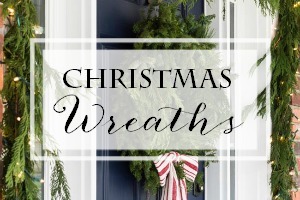 It’s the time of year that our weary world rejoices and everyone wants to go home for Christmas. That’s what is always in the back of my mind when I decorate our home for the holidays. My kids are coming and I just want everything to be welcoming and cheerful. Believe me it’s nothing fancy and it doesn’t break the bank. 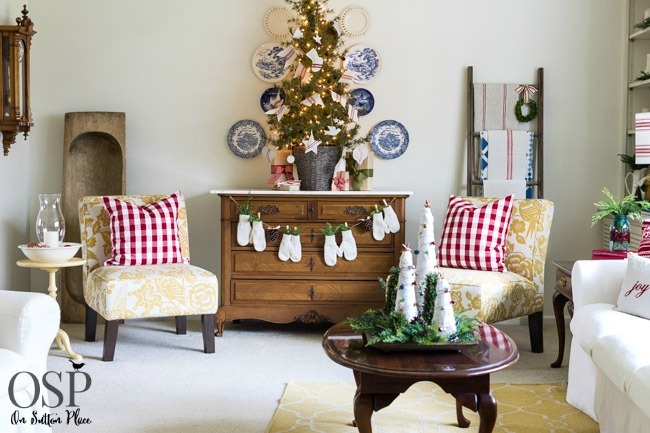 Today I’m sharing my Christmas Home Tour and I hope when you see it you say to yourself “I could do that.” I’ll try to keep my chit-chat to a minimum and let the pictures speak for themselves. I might pop in with a helpful link or two though! I couldn’t possibly post a home tour without a picture of our little dog, Kelly. Some of you may remember her attack last summer and I want to let you all know that she is completely back to normal. Looking back on those weeks, I realize now how close she came to dying. At the time, I couldn’t let myself even think about it. As this year draws to a close and I reflect on things to be thankful for, her recovery will be at the top of the list. I just love your simple, classic style. 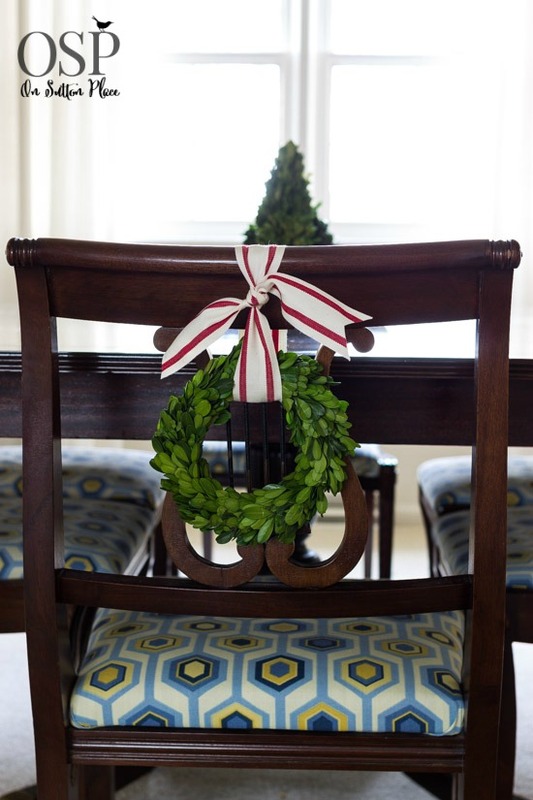 It’s beautiful and festive without completing overwhelming your home with Christmas décor. I hope you had a Merry Christmas. I love following your blog! I am in love with your home! My husband and I plan to start house hunting this spring and you can count on me visiting your blog very often for design ideas. 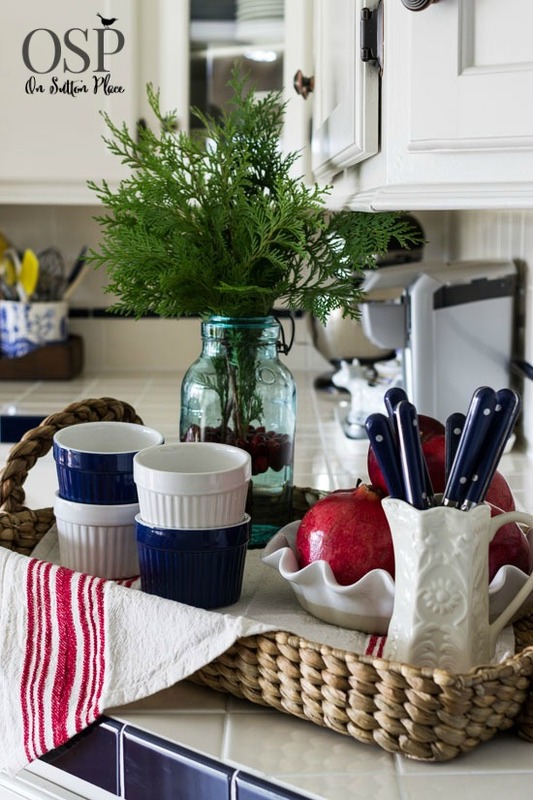 You and I share the same style and I am very inspired by your home tour photos. 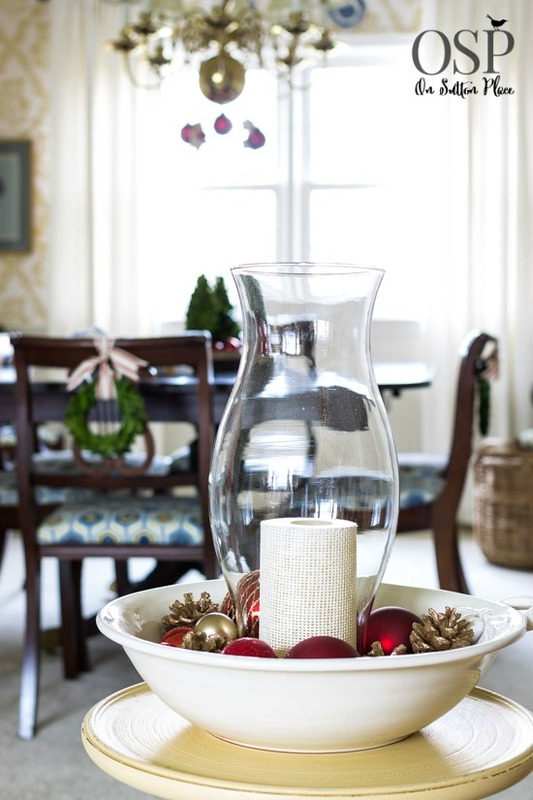 Hello, your home is even more splendid during the holidays! You have quite a gift for decorating. Thanks for your quick reply, Ann! I picked up one of mine on clearance at Walmart. It must be 12 years old and held up well until a storm blew it off the porch last fall!! I’ll check Cracker Barrel too, they sell their models at a discount once or twice a year. Ann, your home is so welcoming. I loved seeing your little pup resting on your sofa. 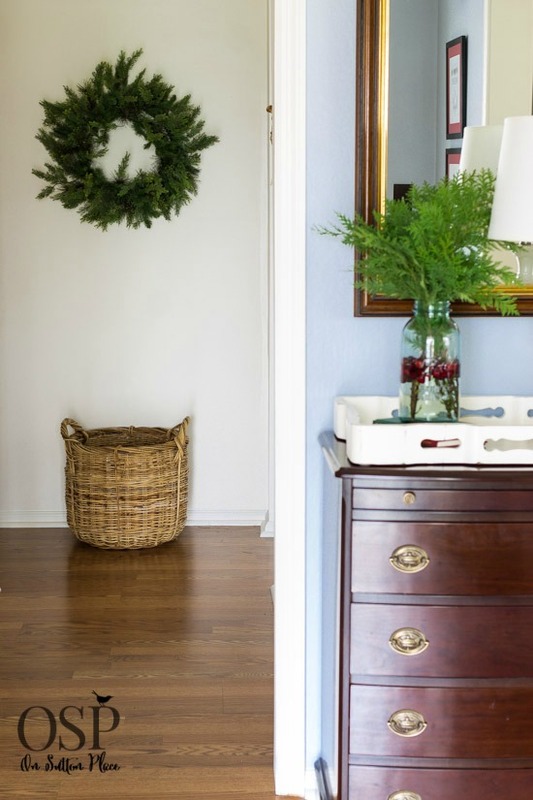 I love all the fresh greenery in your decorating. Thank you Kathy! Kelly and I want to wish you the best Christmas ever! Ann, I love your Christmas home tour. Your beautiful style is infused into every room. I hope you and yours have a wonderful memory making Christmas. 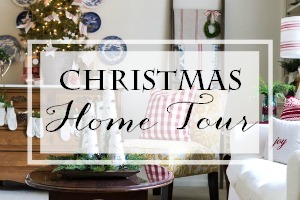 What a beautiful holiday home tour Ann! 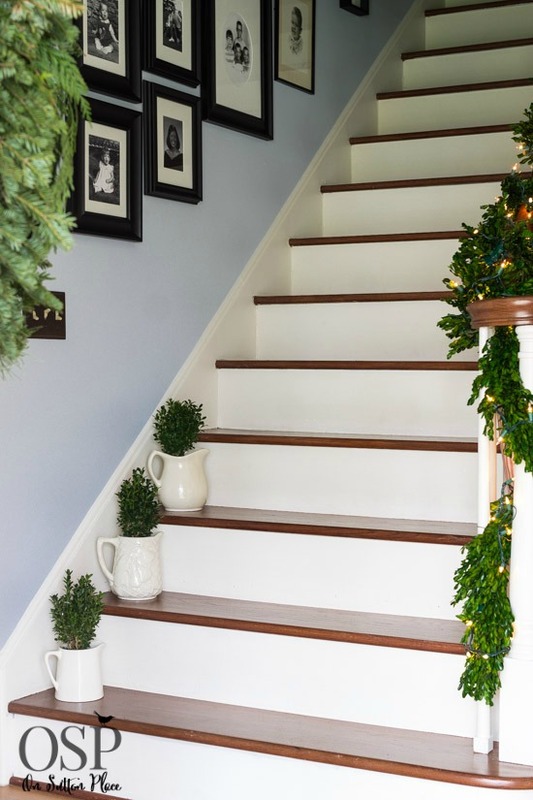 I love all of the fresh greenery and pops of red throughout, those stockings on the staircase are so pretty! Wishing you a very Merry Christmas! So very nicely done. Not overpowering – just perfect. Thank you Julie…wishing you a very Merry Christmas! Ann! I just love your holiday home! Everything is gorgeous, and the porch is my very favorite! Thanks for the tour! Everything looks so pretty….such beautiful fresh greenery. Thanks for sharing your talents! Merry Christmas! Ann your home is as beautiful as ever, I love the way you decorate with a beautifully restrained hand, never too much or too little always just right. LOVE the Beetle pillow, I just got two in the mail today, fell in love with them for my guest room beds!! merry Christmas Ann! Oh what a perfect way to use those pillows! I’ll be over to visit and check things out. Merry Christmas Kathysue! Hi Ann, I have just found you! Your home is gorgeous and I love how you have decorated it for Christmas. It looks so inviting. I will visit you often from New Zealand! Hi Pauline! Welcome to On Sutton Place…best wishes for a Merry Christmas! Thank you, Ann. After living in NZ for 20 years, I still long for a white Christmas!! 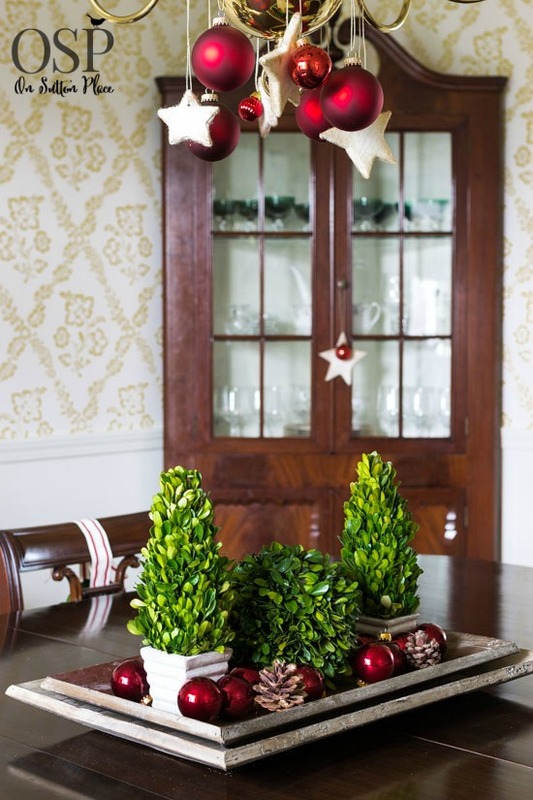 I love the way you have mixed the greenery with other Christmas decorations. The front porch and stairway, what a lovely welcome for your family and friends. Wow, Ann what a beautiful holiday home you have!! I absolutely love your staircase and truly, your photos are stunning! Happy holidays!! Such a gorgeous tour, Ann! I love your front porch! Ann your home looks absolutely beautiful…I love every single detail!! 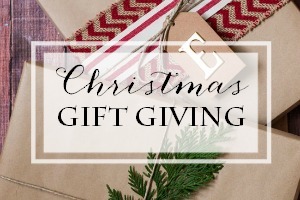 I think of you every time I pull out my little grain sack stockings…they’re a favorite of mine! Ann, I just love your staircase. 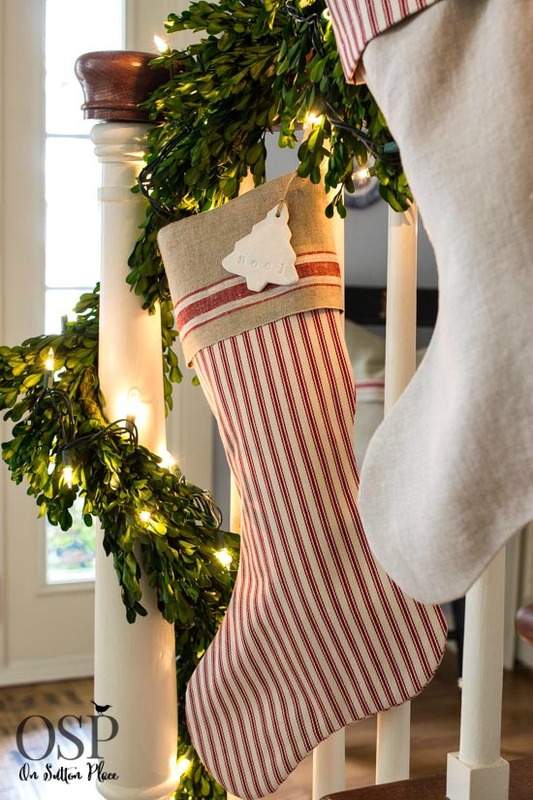 The stockings hanging on it with the garland is just so beautiful! Ann, I think your home is a perfect place to be! So beautiful, warm, clean, and totally inviting! I just love your style! Merry Christmas to you and yours!!! Everything really looks beautiful, Ann. Your vignettes are gorgeous. I happily pinned away! I love everything you did, Ann, but then again, I always admire your taste. It’s always simple, but elegant, too. If I celebrated Christmas, I’d want my house to look just like that. 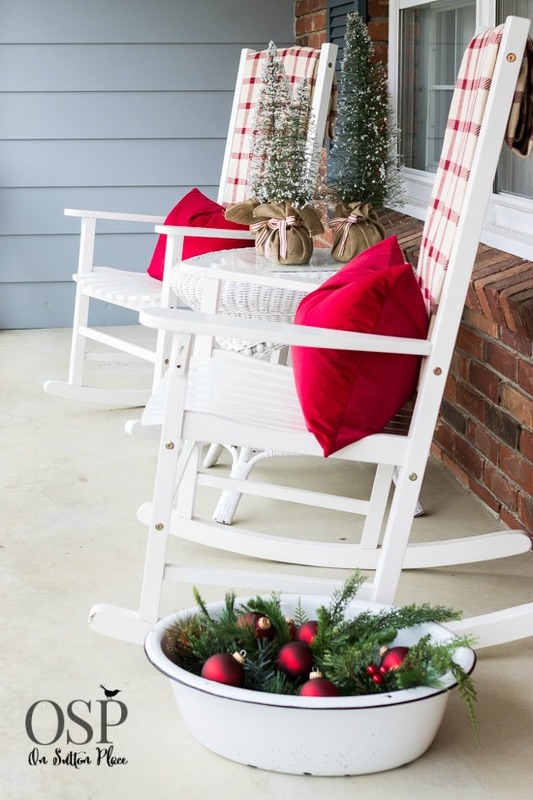 I LOVE the red and white on the porch chairs! Absolutely gorgeous, Ann! 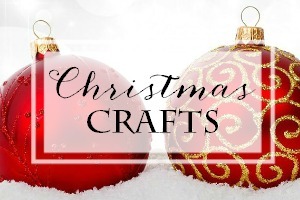 You’ve created yet another warm, inviting and stunning Christmas home! 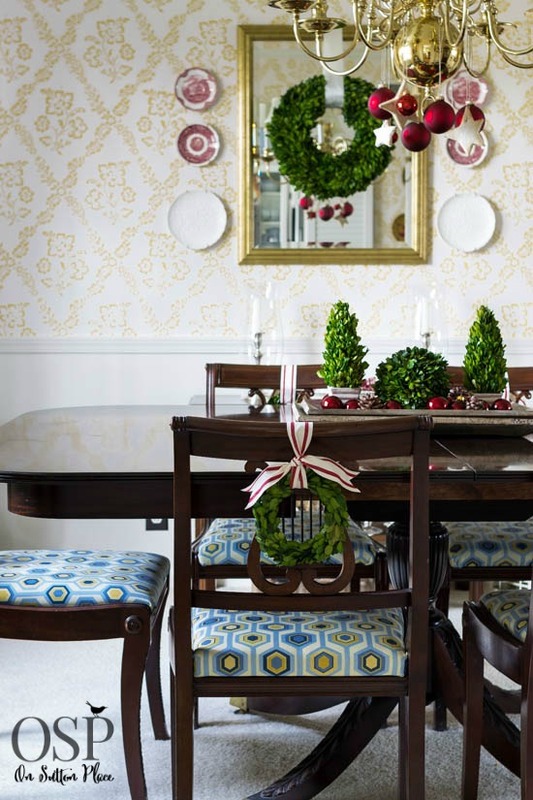 I love the pops of red … so festive! And, don’t you just love your red/white checked and “Vinter 2014” pillow covers from IKEA? I scooped both of those up, too, before they were gone from the shelves! I truly hope you’re entertaining this holiday season, as your gorgeous home needs to be enjoyed in person by lots of friends and family! Happy Holidays! Your home is lovely Ann. Thanks so much for the tour. Your home is beautiful! 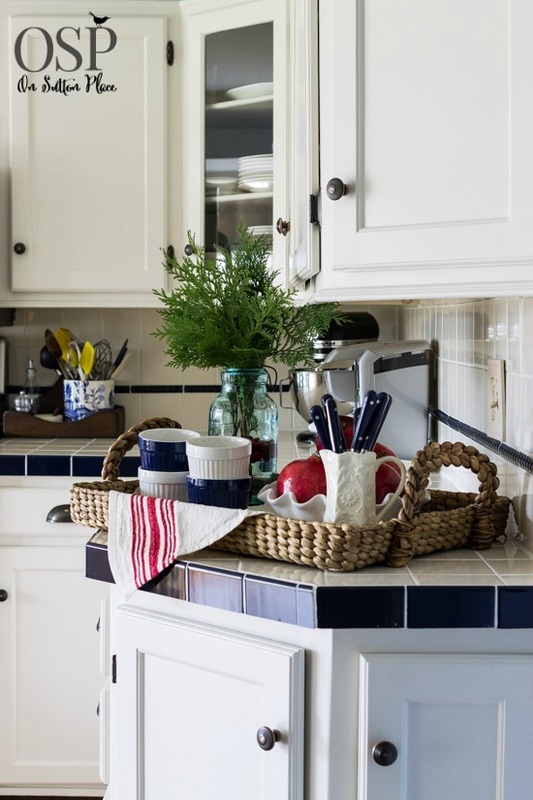 I love the decor items and that scale is so cute in your kitchen. Can you come and decorate mine? :) You really have a gift! Great tour. Your house looks great. And I love your kitchen. Especially the tile countertops. Thank you so much for sharing your home and decorating ideas. 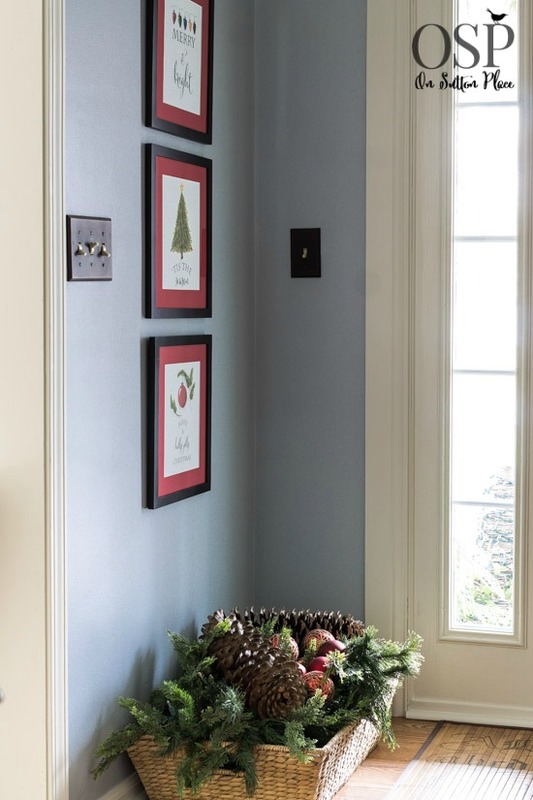 I downloaded your Tis the Season and Have a Holly Jolly Christmas prints, added a gorgeous oval Costco border – and I now have that extra flair that I needed in my guest bath. And, I ran out to IKEA to pick up the adorable check pillows to sit on two dining room chairs that are flanking a holiday sideboard. I love it that you have real style on a real budget! Ann, your home is warm, and lovely, and so inviting! What a pleasure to enjoy your beautiful photos. Merry Christmas! Thank you. Most inspiring, especially now that my Italian family has died out … our kids and grandchildren live in all parts of the world, Christmas has become a sad time for us left in South Africa. Bless you Sylvia…may you find peace this Christmas season. Oh Ann, simply. stunning. I love all the fresh greens and thoughtful touches. 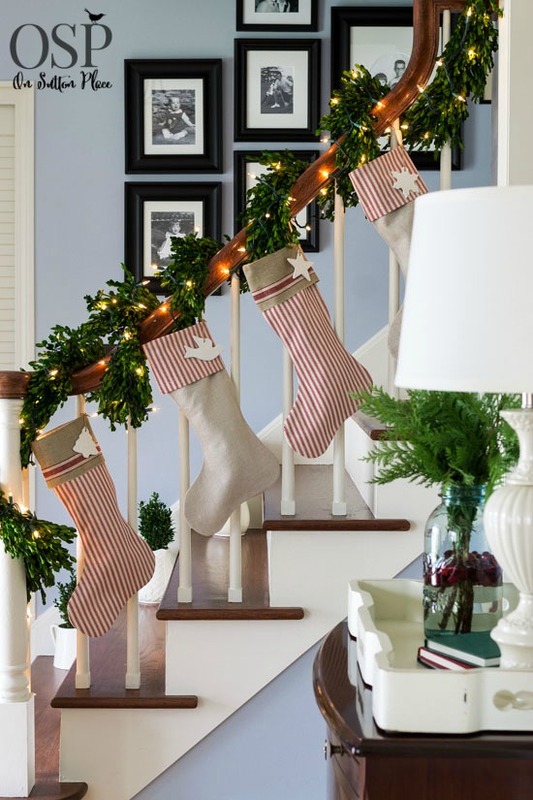 The stockings on the stair are gorgeous! I hope you and your family have a wonderful Christmas. What a beautiful home you have, Ann. 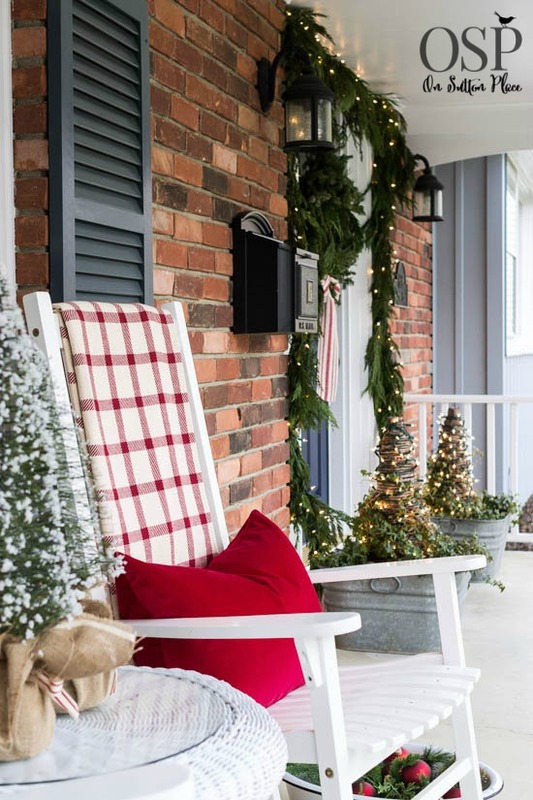 The front of your house is so inviting, and I love the stockings hung on the railing! Thank you for sharing your lovely holiday home with us… Pinned! I love everything about your home. I love that you chose to put family photos in your shots. Your dog is too cute! Thank you Barb…I wish you and your family a Christmas filled with love and joy! Thank you for sharing your Home Tour. Everything is beautiful. Everything looks so beautiful! I hope you have a wonder Christmas! As always, your decor is delightful! 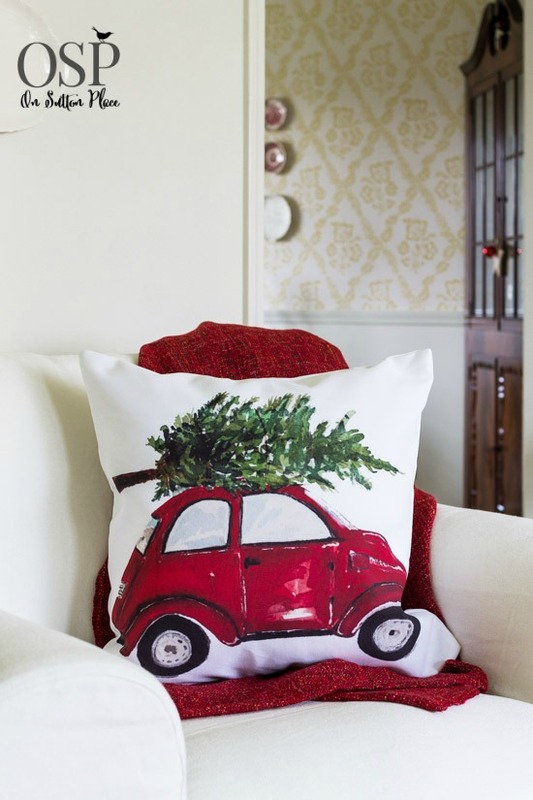 I do love the little red beetle bug pillow….that’s exactly what I drive: a red VW beetle! So cute. I loved your style. I find as I get older that simpler and natural is more appealing. The use of baskets, trays and greenery was great and love the JOY plates. Enjoy your family’s visit. I also want to say that I appreciate how easy it is to view your blog in my tablet. It is not cluttered with moving ads and pop ups and it doesn’t take ages to get it all downloaded. I call that considerate! Thank you Nanci for telling me about my blog load time…I never know if what I’m doing is working or not! Happy Holidays! This is so beautiful, I love all the little touches you did around your home. Those stockings are so so pretty and I love the JOY Plates! Ann, thank you for your email invitation today. I loved the home tour. Your home truly fits ‘comfort and joy’ perfectly. I’m also now in love with Tracey Gurley’s clip art designs. Isn’t Tracey amazing? Thank you for stopping by…Happy Holidays! Enjoyed your tour greatly, Ann. I think everyone has bought Lucy’s cute pillow including me. I love your decorating style Ann. I admire how you put personal touches throughout. Merry Christmas! 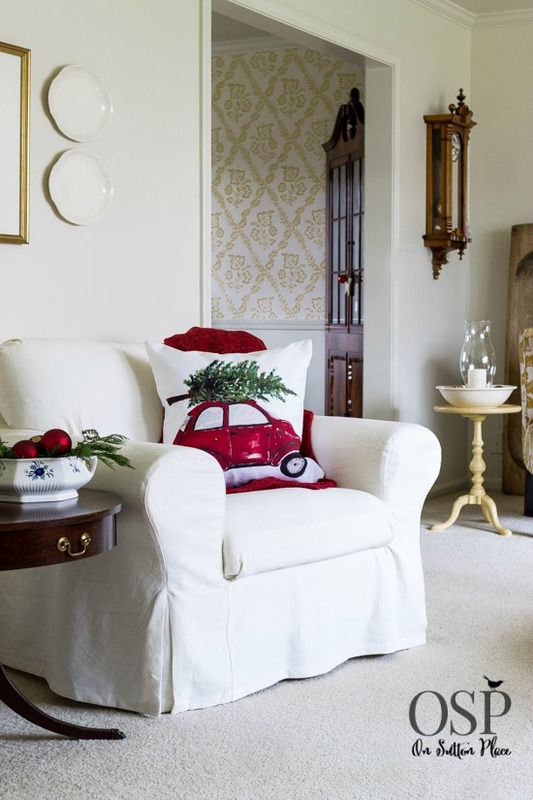 Ann…your home is always so beautiful and truly wonderful at Christmastime…so wonderfully decorated and enhanced by your creations….truly love all of the pretty details…going back to study your details again!….and love the Beetle pillow….my son’s first car was a VW Red Beetle!…I think he needs one of those!!! so enjoyed the tour! Your home looks so perfect for the holidays. I want to step through the front door and just make myself at home. Love the simple approach. IKEA is such a gold mine for affordable holiday touches, isn’t it? I hope you and Kelly and the whole family enjoy your holidays in your lovely home…or wherever you roam. Ann your home and tour is stunning! Your stockings on the banner with the cute tags are awesome. Everything is. I wish I could come and see it all in person. You are an amazing decorator! Your home looks so welcoming for the holidays. 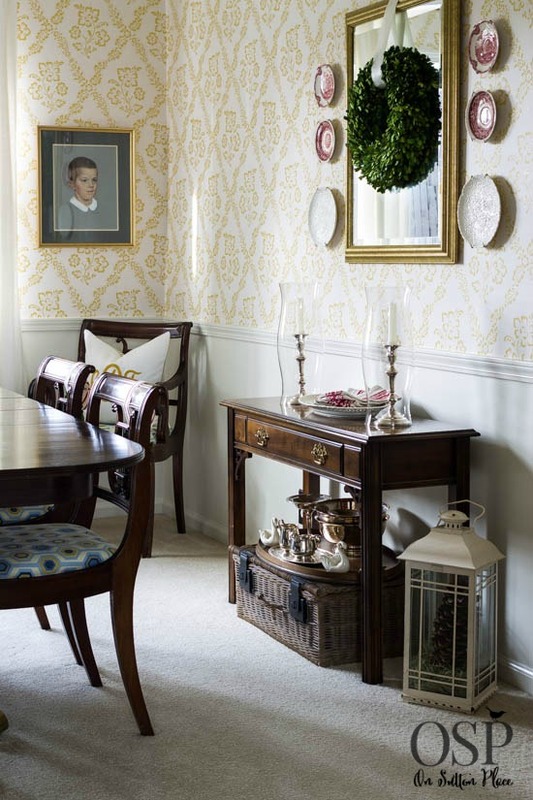 Love the pops of red throughout the different rooms. Thanks for sharing and have a great week!! I love your classic vintage style. Looks gorgeous and festive. I’m a new official follower from Ont. Canada. Absolutely Charming! Simplicity at it’s very best…not too much, but just enough. I enjoyed every pic. Ann, your home is so lovely. All your decorating is simply elegant. Your blog is one of my favorites because your sincerity and kindness shows in your decorating and I really feel like how you truely offer good advice for family’s really decorating on a budget but want their homes to be lovely and inviting. Glad to see Kelly back to good health, she looks comfy on the couch. God bless you for sharing your creativity. Merry Christmas. How tasteful and welcoming! The cherry reds and fresh greens are a delight. Love those little Ball jar arrangements. Straight out of a magazine! I am so impressed with everything you do but this takes the cake. Thank you for the inspiration! Your home is so beautifully elegant. 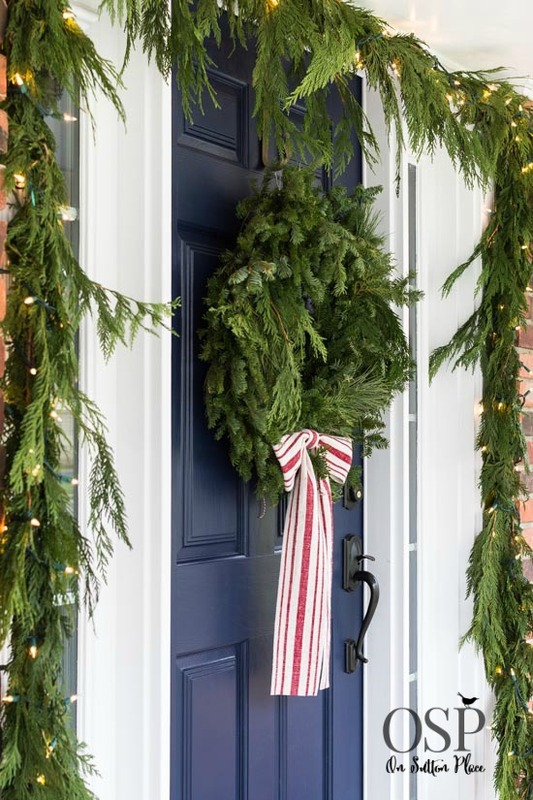 All the right touches to make Christmas homecoming so welcoming. 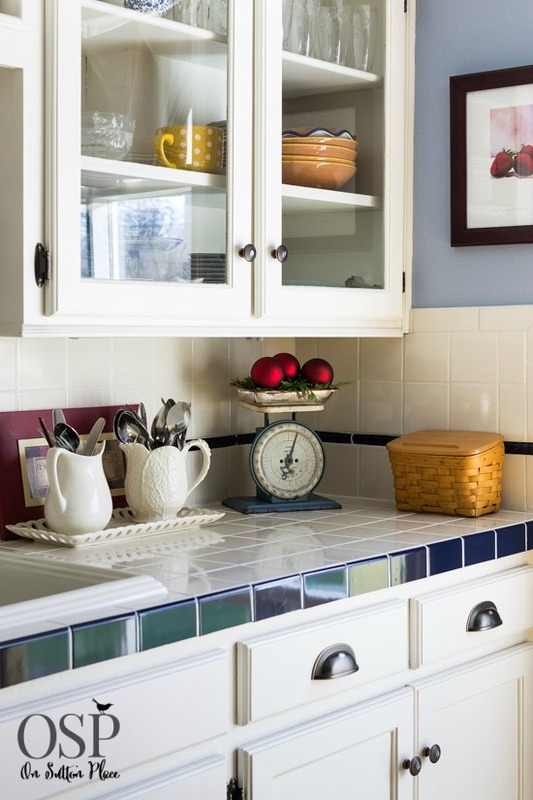 Every time I see your blue cupboards and yellow island I fall in love with your kitchen all over again. Loving the use of blues in the Christmas theme. Merry Christmas! 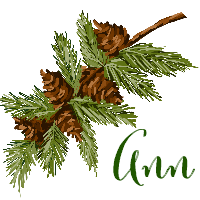 Ann – Your house is lovely – simple and cheerful. Just perfect. Thanks for the inspiration! Ann, your home is beautiful. Thank you for the wonderful ideas. Your home is stunning! I love all the festive reds and greens. So fun to find your blog and be part of this tour with you. Merry Christmas! Such a lovely home. Thanks for sharing. Sonya from athomewiththebarkers.com sent me over. Merry Christmas. Ohhh Ann, I love it!!! So classic and beautiful!!!! Happy Holidays!! I have never joined anything on pinterest, but I was inspired by the lovely shirts pillows. My children recently lost their father and I have been looking for a way to let them keep some of his things without keeping the whole closest of clothes. When I visited your OSP home page I was hooked. Looking forward to incorporating some of these things in my own home. Beautiful work, Thank you. Ann, your home is always beautiful but it is even more so at Christmas! I love how you’ve incorporated more red into your Christmas decor. My favorite image is the one with the JOY letters on the plates in your kitchen! Pinning! When I first followed a link to your site (not that long ago) it was your beautiful, yet simple, style that prompted me to subscribe. 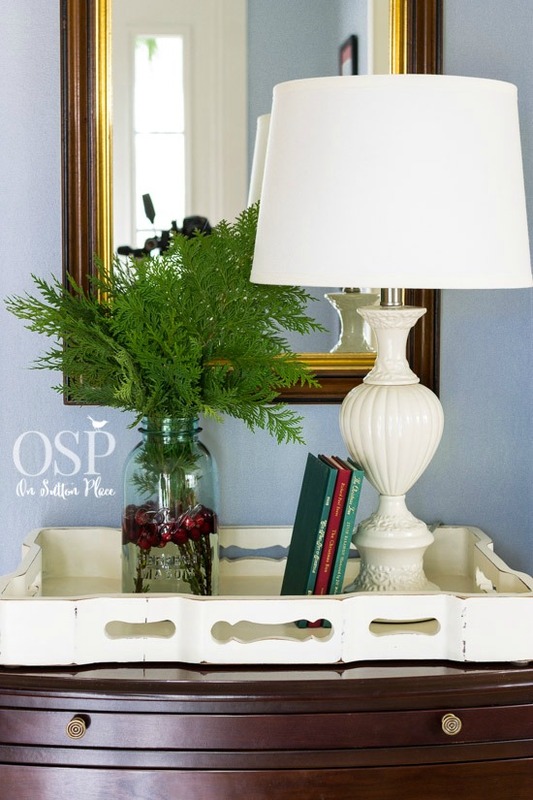 I absolutely love the simple charm you manage to express throughout your home that inspires me with each post. Ann, your home is so beautiful! This has to be one of my favorite posts! We are traveling this year and I didn’t do quite as much decorating. Your pictures make me want to get my boxes out and start decorating! Merry Christmas and a Happy New Year! I love your home and decorating style. Would you be willing to share about the rockers on your porch? Where purchased? Can they be left out in the weather? I am moving to a small patio home which has a front covered porch, and I think a single rocker would look great. I don’t know how they will do over the winter…I can let you know in the spring. I hope OK because I have no place to store them and they will be sitting out on my porch. Thank you for stopping by! Thank you for your prompt reply and for the link to purchase the rocker. 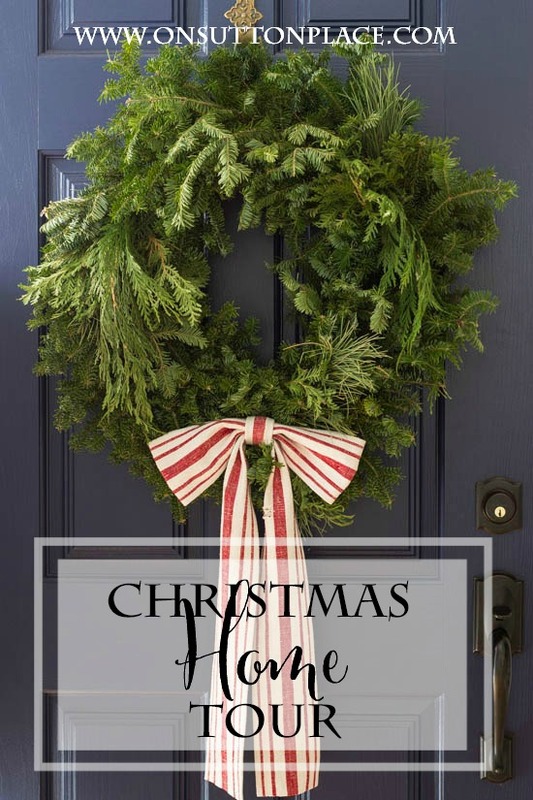 Your home looks beautiful all decked out for Christmas Ann. I love that pillow too! Ann, love the stockings with their clay decorative tags on the stair railing. 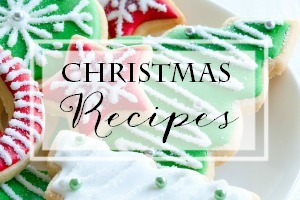 Your son and daughter will love the warmth and spirit of Christmas at your home. Beautiful home, Ann. I love the lamp shade you have in the living room. Did you cover it yourself with one of your grain sacks? I have been looking for the perfect lamp shade for my kitchen and I think that it it! Can you tell me how I might get one?? Hope you have a wonderful Christmas. Your home looks beautiful! 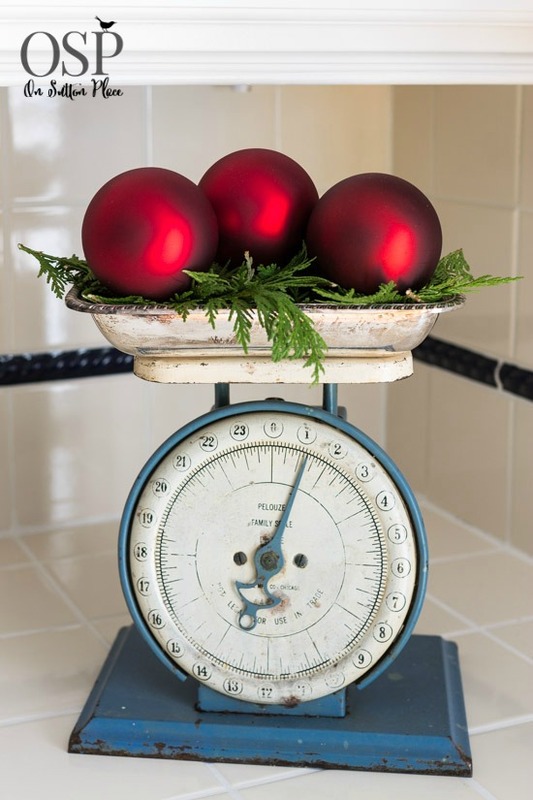 I have a scale with a bowl of ornaments too! I LOVE old scales! Lovely!. I’m sure your family and guest will agree. It all looks fabulous Ann, I love every room but the porch is my favorite. What a wonderful treat for whoever walks through your doors. 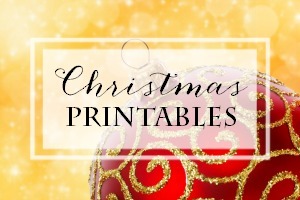 Pinning oodles of these! !